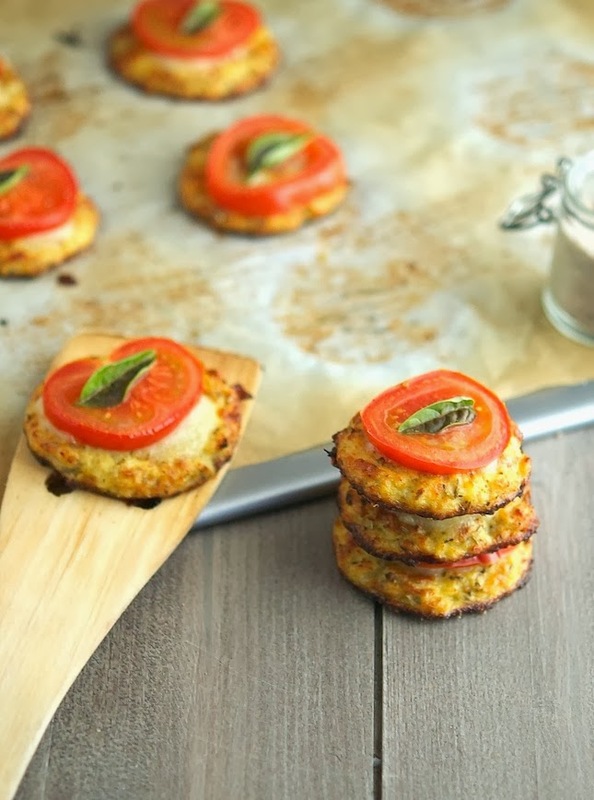 All things cauliflower crust friends! Yep, after the cheese pizza, pizza marinara and the worldwide famous calzones it was only a matter of time before I’d come up with something new using cauliflower crust. This time around is mini pizzas or pizzettes. Basically finger food. Two words: Amaze-balls. Which is in fact one word (or maybe it’s not even a word), but I like to use the hyphen and think of it as two words. It adds emphasis and drama which is what I’m trying to convey here. Now picture this, football game on TV, friends, beers and cauliflower crust pizzettes as a snack. Amazement, confusion, admiration, astonishment, awe, bewilderment, confusion, perplexity, wonderment. All these emotions registering on your friends’ face. Maybe they'll just say “Dude they’re pretty awesome” and they’ll just continue watching the football game, devouring the pizzettes. Which is really all the validation you need. Because let’s not forget that actions are worth a thousand words, and no leftovers means that you have succeeded. Score. 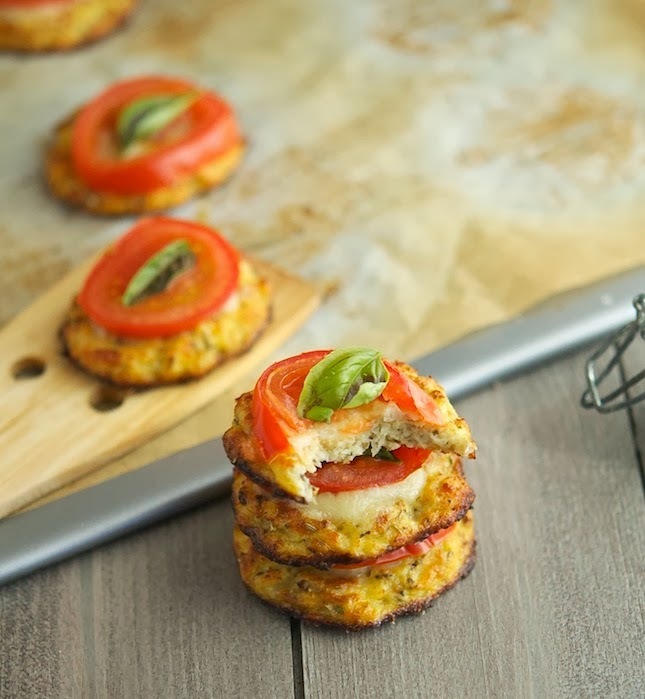 Cauliflower Crust Pizzettes Print this recipe! I know some of you struggle with cauliflower crust. This recipe works, I promise. But you have to squeeze the bejesus out of the cooked cauliflower rice. That’s the only way to do it. When it comes to toppings, do play around. Whatever you like on a pizza you can put on pizzettes. In a food processor rice the cauliflower (it should be evenly chopped but not completely pulverized). Transfer to a microwave dish and microwave on high for 8 minutes, until cooked. Bake in the oven for 12 to 13 minutes until golden, the edges of the pizzettes might be a bit charred. Remove sheet from the oven and heat the broiler. 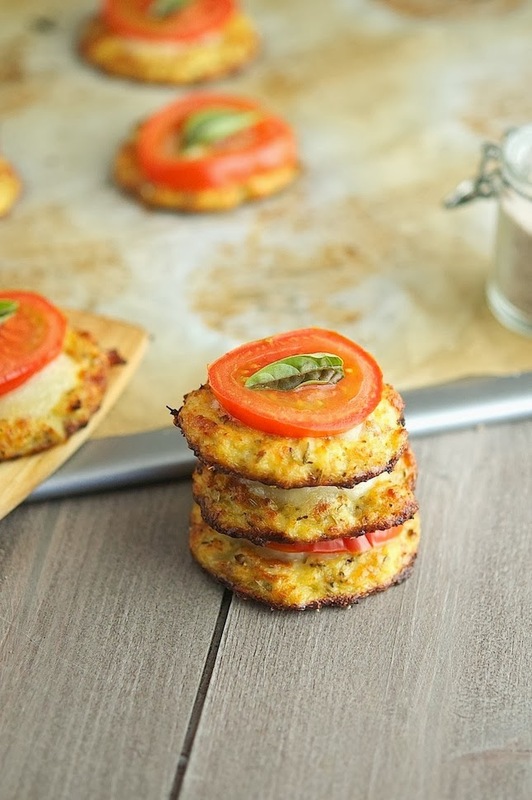 Top each pizzette with a large pinch of shredded mozzarella, a tomato slice and sprinkle with a bit of salt. Broil until the cheese is melted and the tomatoes are slightly roasted, about 3 to 4 minutes. Believe it or not, they taste better than they look! They are indeed perfect for parties! Your cauliflower crust looks really good Mike! Last night my daughter and I tried out your spaghetti squash and meatball recipe, I used turkey instead of beef and went a little lighter on the cheese - and yum! It was so good! I cannot wait to try these out too! I'm so happy you liked the spaghetti squash with meatballs. It's definitely one of my fave recipes lately. I've been making it over and over again. Let me know how you like the cauliflower crust! Fantastic recipe Mike, can't wait to try it out! Oh wow, perfect timing. Pinning these. I have a head of cauliflower in my fridge and am hosting an appetizer party on Sunday. Will report when I make these. Can I come over too? Ive made this before and love it but i always wonder why we need to cook it before, wouldnt it work raw baked in the oven ? I've tried it already and I can tell you it's no good. Basically you get a mushy crust if you bake it directly with the topping on. In other words the pre-baking is essential for a crunchy crust! They are so dainty looking. Love the mini pizzettes. I could eat the whole bunch watching a game. Thanks for this awesome recipe! Looks great! Just a quick question: When you say to cook them for 8 minutes in microwave, do I just spread the grated cauliflower on plate dry and microwave for 8 minutes (wont it get burnt?) Or, do you mean to put it in a bowl of water and then microwave for 8 minutes?